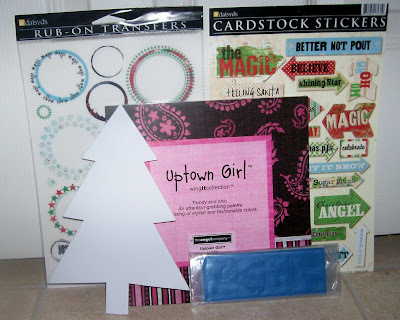 Confessions of a 20-something Scrapbooking Mother: 3 Days till Christmas! I can't believe how fast Christmas has snuck up on us! I'm so excited because Aaron will actually be alert and able to open presents this year! I can't wait! I had the best day yesterday! Spent the entire day shopping! Aaron and I went in the morning with a friend, but didn't really find much. Then when I came home and checked the mail, I GOT BLOG CANDY!!! So excited! Look at the beautiful card Janaina sent me! Isn't it gorgeous! She is so talented! Then, look at all the goodies she sent me! Daisy D's Christmas stickers and rub ons, the cutest paper stack that I can't wait to use for my niece's album, a chipboard tree that will be in my scrapbook soon, and (you can't see them) some adorable baby stamps! You should definitely check out her blog http://2worldswings.blogspot.com/ . She is wonderful and her work is amazing! Then I went shopping with my mom and got a few last minute things, and even got a few treats for myself! We have a ribbon outlet about a half hour away, so I went there and filled up 2 huge shopping bags of ribbon spools and only paid $6! Then I got my husband his Ipod that he has been asking Santa for, and then we went to ACMoore! I needed some new mats for my Cricut Expression, I got my niece a huge tub of foam stamps for $5 (she's a little crafter! ), I got a DCWV chipboard stack that I can't wait to tear into, and I got a new pack of $15 pens for $3!!! My mom also bought me a Cuttlebug and a few texture plates for Christmas!!! So excited! After all the discounts, she only paid $35 for it! I love ACMoore! Well, I need to go and start my day. I only have about a hundred things to do today-no pressure! I just thought I'd post one of the photo screens I've been working on for Christmas. 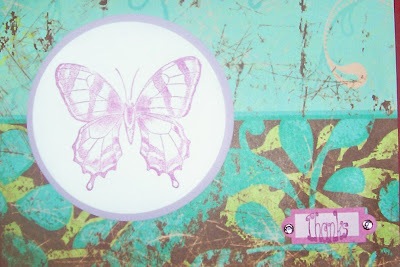 I used the MME paper pack that I bought at Costco a few months ago. 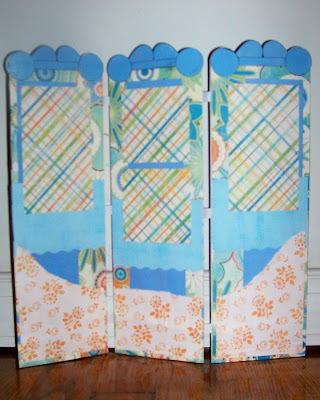 The orange flowered sections towards the bottom are pockets, and the plaid mats are for photos. I'm giving this one to my mom with pictures of Aaron of course! It needs a few more embellishments, but I thought I'd go ahead and post since I probably won't be back until after Christmas! I hope you all have a wonderful Christmas, and you get to spend it with all the people you love! I love your new rub-ons. The screen looks great with the blues and oranges. Fun blog and great to have found you. Christmas cards and a mini album!